Blessed with blue sky and sunshine on Saturday, Santa arrived by helicopter to a cheering crowd for a very special visit sponsored by Education Outbound. Santa Claus and his Special Assistant Elf were flown in by pilot John Donovan, owner of the Manchester Athletic Club where over 100 underprivileged children from the North Shore eagerly awaited his arrival. Education Outbound, with the help of many generous donors, arranged for each child to receive their own special present. The children range in age from 2 to 14 years old. Some of the children live in foster care and some live in children’s shelters-the holidays are particularly difficult for these young children. Carla King with the Department of Social Services helped Education Outbound invite and transport the children who visited, and select and wrap the gifts. The children arrived at 1 p.m. for hot cocoa, cookies, and games. Santa landed at 1:30 p.m. and greeted the children outside. The children escorted Santa into the club to open up their presents. Santa visited with each child individually presenting them with a gift from their personal wish list. Each guest had a Polaroid photo taken with Santa and plenty of space to open their gifts and have a good playtime. “Some school districts have decided not to have field trips anymore because of budget constraints. Education Outbound is designed to enhance children’s educational experiences by introducing them to places and special things they might never be able to see.” Education Outbound believes that every child should have the chance to encounter a learning experience that inspires, enlightens, and provides hope. The goal of Education Outbound is to have an impact on underprivileged children, positively influencing their lives. In addition to this third holiday event, Education Outbound has organized, funded, and implemented 20 filed trips, affecting over 350 underprivileged children. 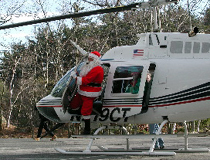 John Donovan Jr., owner of the Manchester Athletic Club, also donates his helicopter and his time as personal pilot to Santa. He is a committed board member of Education Outbound. If interested in contributing to this special Education Outbound event, checks may be made payable to Education Outbound, and sent to: Megan Connolly, Education Outbound, PO Box 333, Manchester, MA 01944.